For the sake of diplomacy and for the sake of those perhaps scarred by an experience with an ‘unfriendly’ or one might even say ‘antisocial’ cat, let’s also assume that there’s another camp of people who are on neither Camp Cat or Camp Un-Cat but Camp ‘Maybe Cat’. All this being established – let me dive into the article and tell you why I think the words ‘cats’ and ‘Christmas’ deserve to be in a headline together. Let’s face it, who doesn’t love trees? Who doesn’t love to climb trees? Who still climbs trees? *probably not as many of you are raising your hand, unfortunately* Who still wants to climb trees? Most of grow up climbing trees but then stop at some point when we get too big, climb-perfect trees aren’t as readily available and/or we get self-conscious because we’re now adults. And so, for a tree to be INSIDE, wow. For us humans, the smell of pine, the texture of the branches and the tradition – and luxury – of carting a real, live tree inside the home, is an amazing thing. For cats, this is the case too. It’s like outside just became inside. Many will attempt to climb Christmas trees. Most will soon realise this is probably not the best idea. 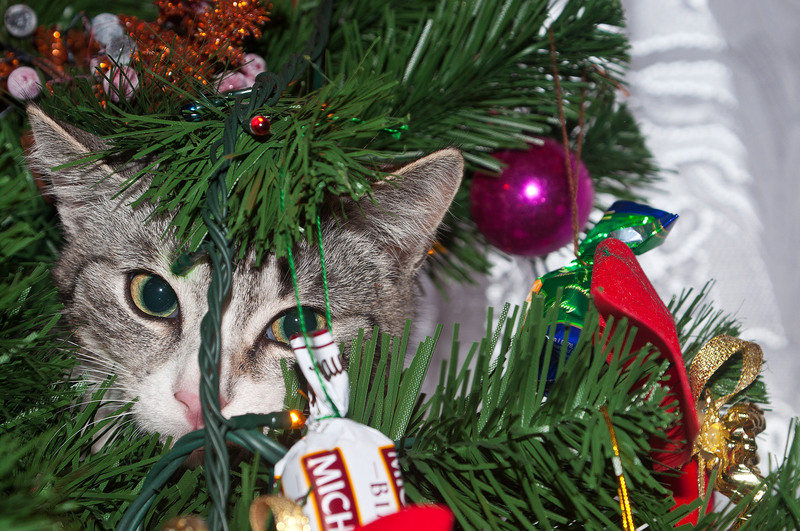 HINT: curious cats WILL probably climb your Christmas tree (they can’t help themselves!). If this is inevitable, a tip might be to let this usually interesting experiment happen BEFORE all the decorations are on! Baubles, they are so pretty. Real glass baubles with snowflakes painted on, or with cute figurines inside -a new take on classic style. Or, there’s just your supermarket brand baubles … nothing fancy but still pretty. You might spend a lot of money – or hardly anything – on your baubles but basically your cat doesn’t really care what kind of bauble it is… whether it’s blown Venetian glass or Target metallic spheres at $5 a container. So, there you have it. Cats love baubles. LOVE baubles. The trick is – have your baubles high up in the tree, away from playful – and waiting – paws. Or, don’t let your cat see your putting up the baubles, because how can a stray bauble not fall prey to such an eager playmate? The other option is to just let your cat enjoy the baubles but don’t have anything ‘breakable’ near where furry friends can take them off the tree, where in some cases, the whole tree has been known to topple over. An old proverb* says: where’s there’s a box, there’s a cat. And this is a truth universally known. What may not be as commonly known, perhaps, is just how much cats can love paper too. When a present from underneath the tree is unwrapped, a cat gets its Christmas wings. What I mean by this is, when you unwrap a present from underneath the tree and enjoy the present, your Christmas-loving cat gets a gift, too. And the gift is, of course, the wrapping that it came in! The thing about this is, it could be any sort of paper. Brown paper. Tissue paper. Even – and best of all – any decent sized box which you opened, too. And let us not forget ribbons – ribbons of any kind – but we’ll skip the sticky tape because cats usually aren’t too fussed by that. So whether it’s your Christmas tree, baubles bouncy or traditional (cats just think of them all as toys) or the actual Christmas wrapping itself, our four legged friends can have themselves a Merry Little Christmas, too! *Source of this proverb? You got me, it’s my own. So probably doesn’t count! Reblogged this on Marty's Gifts.